Bear’s head mushrooms grown at the New Hampshire Mushroom Company. Chestnut mushrooms are one of the many types grown at the New Hampshire Mushroom Company. 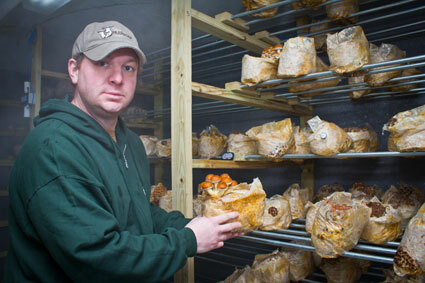 Eric Milligan in the chestnut mushroom growing room. 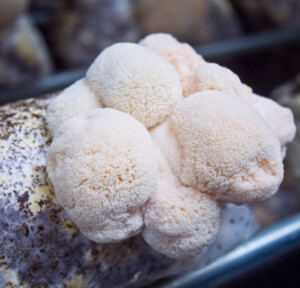 “Pregnant” blocks are placed in an atmosphere-monitored clean room with 14-foot shelves where the mycelium, or root structure of the mushroom, develops. 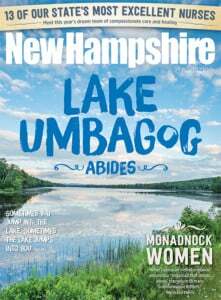 The New Hampshire Mushroom Company. I approach a nondescript warehouse building in the backwoods of Tamworth on a very cold winter day. "Welcome to the farm," says Eric Milligan. 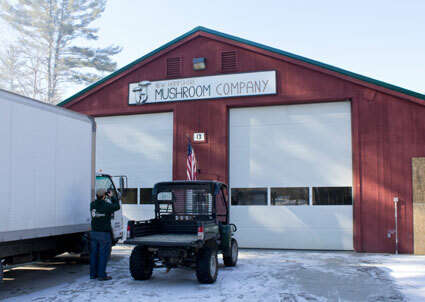 Last July Milligan and three other active partners started a year-round mushroom growing business called simply New Hampshire Mushroom Company. Inside a humble building they have designed a high-tech method to duplicate what nature does naturally on the forest floor. It smells strangely like a brewery. "Yes," says Milligan, it's the blend of the growing medium; it contains a bit of grain as a source of protein. But, before the building and the business, came the passion for mushrooms. Milligan and the others have been foraging for the exotic morsels for years. "I would find them, and just give them away, mostly just to see the smile on people's faces. That's why Dennis Chesley is in charge of wholesaling our products," says Milligan with a grin. Chesley travels up to North Conway and south to Boston and west to Concord, showing off the beautiful fungi to 100 chefs who are eager to incorporate the exotic varieties into evening specials. Another partner, Keith Garrett, is the technology specialist and also a mycophile. He has scouted the woods for exotic varieties for foraging and photography. A few, such as the jack o' lantern, have a natural iridescence. With an open f-stop and time exposure, Garrett has captured their eerie green glow at night. More practically, he has designed the grow rooms for the mushrooms as each mushroom variety has specific cultivation needs. You could call the rooms the "nurseries," it's where the mushrooms mature. But it all starts with a sawdust substrate. Milligan says, "Some people use straw, but we feel the mushrooms taste better with sawdust because many mushrooms grow naturally on logs or the forest floor." To simulate nature, a sawdust block is created in a size about 12 inches long and 5 inches in diameter. Loose sawdust is fed by hand from a hopper and packed into a special plastic bag. The bag has a filter to help keep out contaminants while allowing airflow. 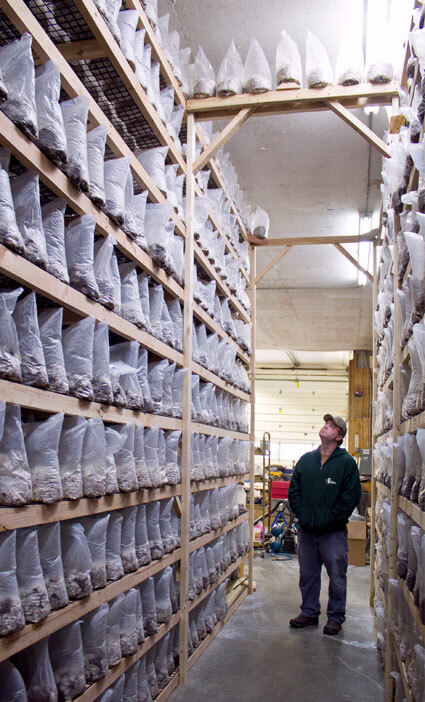 Contaminants are the evil force for mushroom growers. The same environment that supports mushrooms also encourages bacteria and molds. Consequently, the next step is sterilization. The team has built a room within a room that is heated with a steam generator to a temperature of 205 degrees. The sawdust blocks are set up like loaves of bread in a giant oven with an ad hoc system of electrical conduit serving as shelving that can be easily assembled and then dismantled for each batch of 3,000 blocks. A temperature probe set in a few random blocks lets them know they have heated through to 190 degrees. Finally, they are left overnight to cool. At this point in the process you have probably given up thinking about doing this at home. But it gets even more complicated. The adjoining space is the inoculation area. Each time a fresh batch of 3,000 sterile blocks is unloaded, the area built with FDA-approved walls is sanitized with FDA-approved decontaminants. A positive pressure filtration system keeps clean air flowing across the work area as each block is inoculated with spawn by gloved hand. Currently the team purchases the spawn for the six varieties they are currently growing, but Milligan and Garrett hope to develop spore and spawn from a mushroom growing in the nearby woods. Once inoculated, the need for near "clean room" handling is reduced and the "pregnant" blocks are set to develop on shelving built throughout the building. Using the height of the warehouse, some shelving goes up 14 feet. During this time the mycelium, or root structure of the mushrooms, develops. It's not the prettiest sight to the casual observer. Rows and rows of plastic bags/blocks, each developing a different pattern of weird, fine white growth within. This colonizing time can take a week to six weeks depending on the species. At the first sign of fruit body development, the bagged blocks are moved to the appropriate grow room. Mushrooms tend to grow in a gash in a tree so, similarly, the bag is slashed on top to create an opening for the fruit. With Garrett's proprietary control system, the atmosphere in the rooms is monitored by the team for temperature, humidity and carbon dioxide levels. It seems mushrooms and other fungi exude a large amount of carbon dioxide. To offset the CO2 output within the "spaceship" atmosphere of the warehouse, the team has interspersed a number of Areca Palms (Chrysalidocarpus lutescens). After doing a little math they figure that their 10 or so plants are balancing their indoor atmosphere. The mushrooms fruit relatively quickly. It can take just a few days to a couple weeks for a flush (or crop) to be ready to harvest. If all goes well (and much can go wrong, like gills growing on top of heads) the mushrooms are pristine and perfect. "That's what I am looking for, the prettiest mushrooms to sell to our customers," says Milligan. Indeed, fungus never looked so good. The clumps of king oyster, blue oyster, bear's head, chestnut and elm are unworldly beautiful – delicate structures that could be intelligent beings from another planet. That might be a stretch, but with more than 14,000 varieties identified and more being discovered, their forms are novel to the supermarket-trained eye. Yes, there is more to mushroom soup than button mushrooms and Portobello. These exotics have a deeper and more complex flavor and can be used in any recipe featuring mushrooms. Additionally, they all have different nutritional profiles, including protein and vitamins D and B (Riboflavin, niacin and pantothenic acid). As foragers first, Milligan, Garrett, Chesley and fourth partner Max Mancke continue to forage and dry many of these even more exotic varieties and offer them for sale. Many are known for their medicinal qualities. One of the first chefs to encourage Milligan and his crew was Chef Evan Mallett of the Black Trumpet Bistro in Portsmouth. Mallett himself is a forager and now a client of New Hampshire Mushroom Company. Milligan plans to grow more varieties; it's just a matter of working out the best growing environment. "With so many variables, each specific to the local condition, it takes a lot of trial and error to get it right," he says. 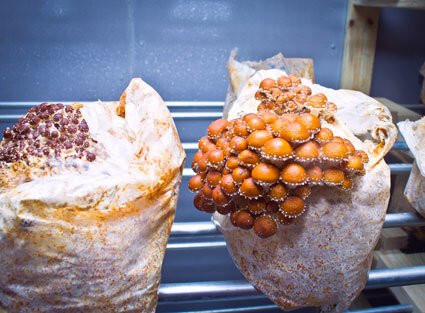 The team had already failed on their first trial of maitake culture. It may take a village to grow mushrooms. Tamworth residents have been very receptive to the new business and stop by to lend a hand, loan tools and give the product a try. The company also gives back by donating the spent – but rich in soil nutrients – sawdust blocks to the local community school to compost in their farm garden.